Slums are the economic and social torment of any big city. The problem of slums can’t be solved with mere money—we must solve social and psychological factors, as well. 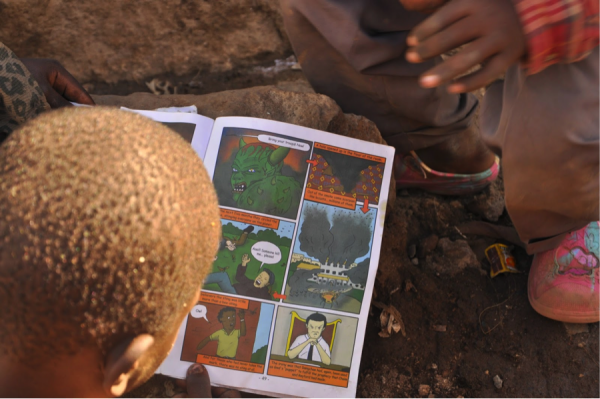 A young boy reading a comic in Mathare. Photo by Joyce Aidi. 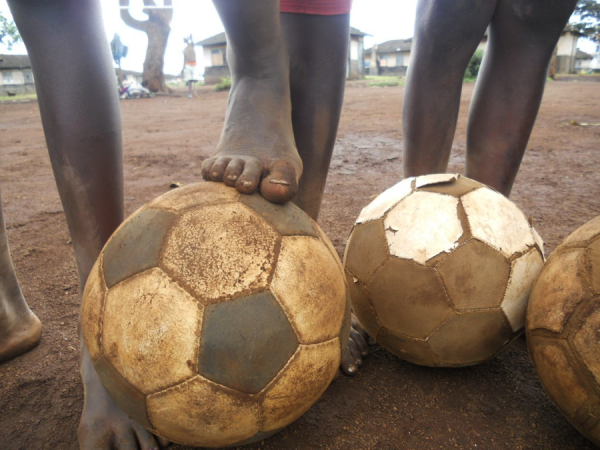 “It doesn’t matter whether we have playing shoes or not,” says Mathare Foundation co-founder Eric Omwanda. “What matters is the passion and skills.” Photo by Eric Omwanda. But Mathare Foundation believes that changing youth mentalities can change a country’s future. This community-based organisation registered with the Kenyan government offers training and opportunities in photography, as well as football and performing arts, to Mathare youths between the ages of 10 and 16. Participating in these activities can help the children develop talent, confidence, leadership skills, and self-expression. The activities are also integrated, in the hopes of building respectful attitudes between the boys and girls. 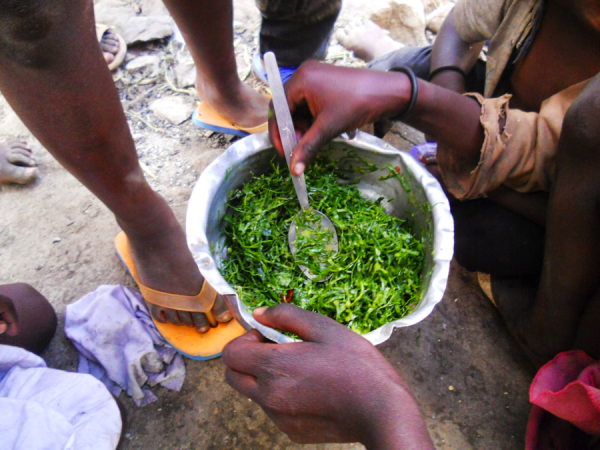 Children preparing kale on the streets of Mathare. Photo by Manase Odhiambo. Most of the uncommon and breathtaking photos in this story were taken by the children who live in these slums. The people living in the slums usually don’t feel comfortable being photographed in their misery. But when the photographer is their own child, they feel less reserved and the picture takes on a new meaning. Eric Omwanda, the foundation’s co-founder—and winner of the Commonwealth Youth Workers Award—also grew up in the slums of Mathare. This year, he hopes to start the Slum Kids Festival, a week-long event that would celebrate the achievements of the students of the foundation and include exhibitions, a soccer tournament, a forum, film screenings, and more. Keeping talented children engaged is our way of helping the country continue to develop. The foundation depends on donations, which is not always easy. But by continuing to work with the children of Mathare, our view of the region’s future is positive. 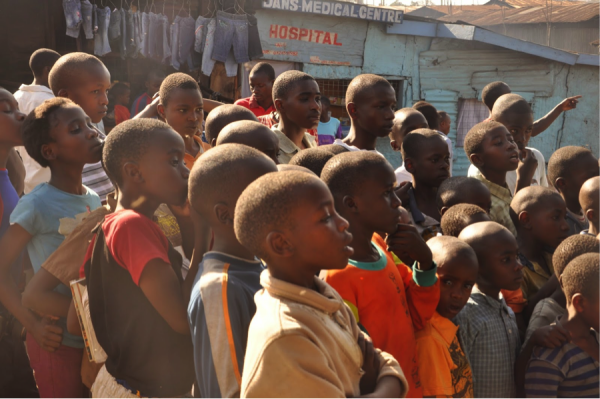 Children watching a movie in Mathare. Photo by Pamela Anyango. Learn more about Mathare Foundation, and become a ONE member to join the fight against extreme poverty.